The Alpha 7R is a small but solidly made camera, with angular lines and a prominent central viewfinder hump. This houses the 2.36-million-dot OLED electronic viewfinder, which gives a view just as large as the D810’s optical viewfinder. It can preview your exposure before you shoot, and display a live histogram to help judge over or underexposure. The Alpha 7R’s contrast-detection autofocus may not be as fast as the phase detection used by DSLRs, especially in low light, but it is unerringly accurate and the focus point can be placed anywhere in the frame with no loss of reliability. This is important, as even slight misfocusing can negate the advantage of having all those pixels. The small, sharp-edged body is peppered with buttons and dials. Some of the control positions are awkward to reach and activate, including the movie-record button and top-plate dials for shutter speed and aperture. Overall, the Alpha 7R feels relatively unrefined, as if Sony hasn’t quite yet decided how its cameras are supposed to fit in the hand and work. This isn’t to say that the Alpha 7R is unpleasant to use, though. In fact, once you’ve set up its many configurable controls, it’s a very capable camera. But it’s not as engaging as similar-sized models from Olympus and Fujifilm. The Alpha 7R uses a new range of FE lenses, currently consisting of a pair of superb Zeiss primes (35mm f/2.8 and 55mm f/1.8), and two image-stabilised zooms (24-70mm f/4 and 70-200mm f/4). All have relatively small maximum apertures, which makes the system more portable than a similar full-frame DSLR set-up. This limited native range is offset by the Alpha 7R’s adaptability to all kinds of lenses. Sony makes the LA-EA4 adapter for Alpha-mount lenses, and third-party adapters allow the use of a huge range of other optics. If you have a set of old lenses in a long-obsolete mount – Canon FD, Olympus OM, Minolta MD or the like – the Alpha 7R may be just the thing to resurrect them. The Alpha 7R’s small size makes it less obtrusive when photographing people. Also, the ability to use the tilting screen as a waist-level finder allows you to engage more with your subject. Unfortunately, the camera’s shutter is quite loud, so your subject is always aware that their picture is being taken. 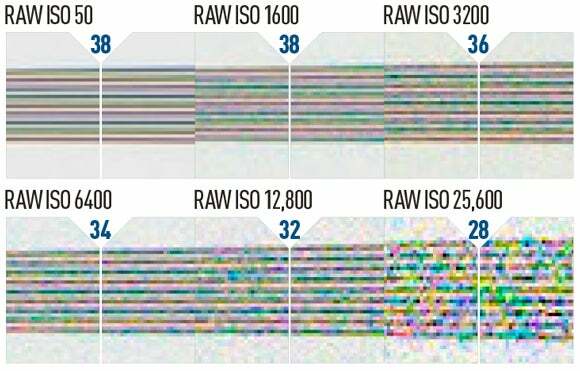 Our test chart reveals that the Alpha 7R’s sensor offers essentially the same resolution as its Nikon counterparts, and drops down in a very similar pattern from over 4000l/ph at ISO 50, through around 3800 l/ph at ISO 1600, to 2800l/ph at ISO 25,600. We don’t see much shutter-related blurring in these tests, either. 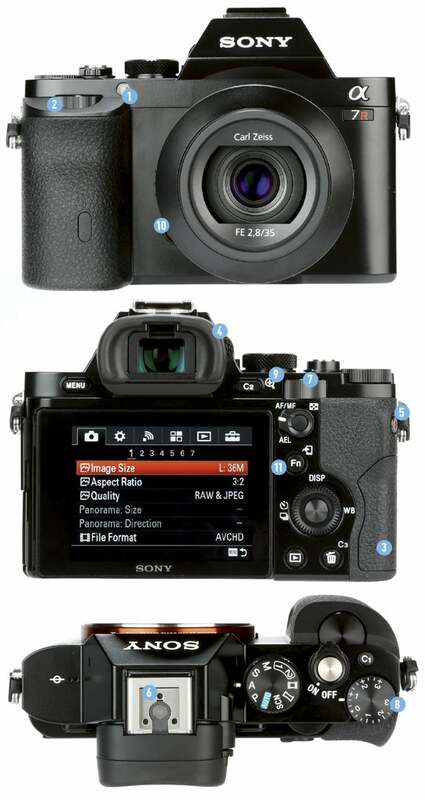 All the indications here suggest that Sony is using a very similar sensor to Nikon, and the D800E in particular. 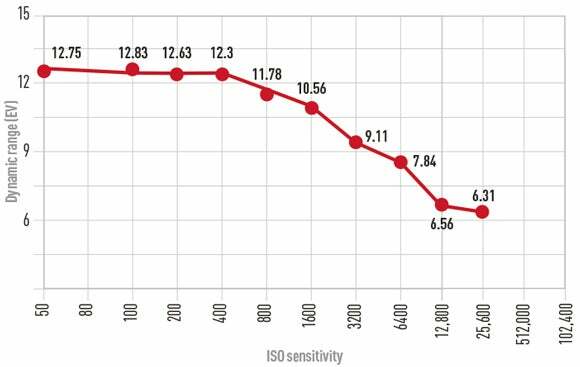 At ISO 50 the dynamic range reaches 12.8EV – essentially the same as the Nikons within the limitations of our testing – and it only drops slightly by ISO 800. A range of 9.1EV at ISO 3200 indicates that images should still be quite usable, but beyond this quality will visibly suffer.Again, we’d probably steer clear of the top settings. Just to emphasise that there’s no clear winner here, the Alpha 7R matches the Nikons in terms of noise performance. Noise is minimal at low ISOs, with luminance noise only starting to creep in at ISO 1600. 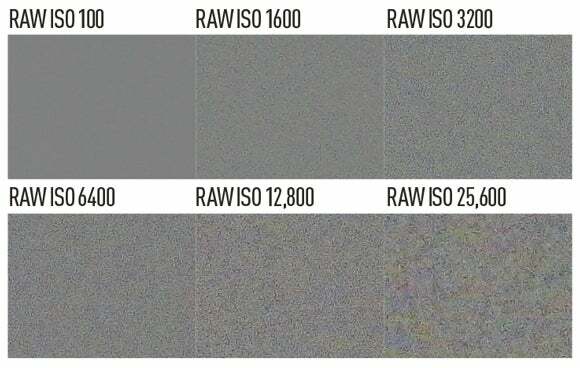 Even when the sensitivity is increased to ISO 6400, noise isn’t excessively high, and it responds well to noise reduction in post-processing. The higher ISO settings again look distinctly noisy, though.